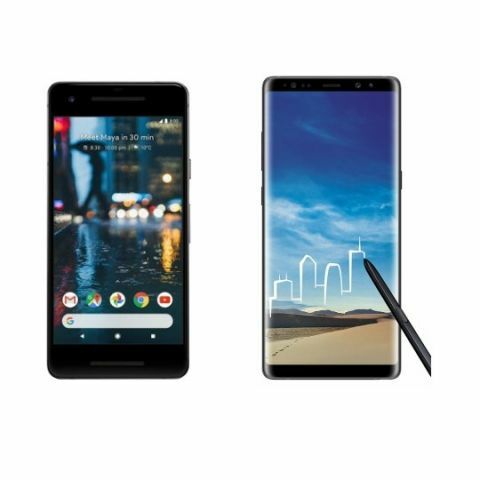 The two online retailers are offering considerable discounts on smartphones by a range of manufacturers like Samsung, Google, Motorola and more. Both Flipkart and Amazon are hosting their respective sales and are offering gadgets and gizmos at a discounted price. Flipkart is hosting the Big Shopping Days sale from May 13 till May 16, whereas Amazon is hosting Summer Sale, which will go on till May 16. We have gone through the many offers on both the platforms and have listed here the best deals on smartphones one can get. The 64GB variant of the Samsung Galaxy S8 Plus has received a massive Rs 10,000 price cut and can now be purchased at an effective price of Rs 43,990. The device is powered by Exynos 8895 processor with 4GB RAM and features a 6.2-inch super AMOLED display. You can buy it here. The 64GB Google Pixel 2 is powered by the Snapdragon 835 SoC with 4GB RAM and 64GB internal storage. It features a 16:9 5-inch display with a full HD resolution. You can buy the smartphone here. The smartphone sports a 6-inch full HD display and is powered by the Qualcomm Snapdragon 653 SoC with 6GB RAM and 64GB of internal storage. It features a 16MP rear camera and comes with a 16MP + 8MP dual front-facing camera. You can buy the device here. The Samsung Galaxy Note 8 is powered by the Exynos 8895 octa-core processor with 6GB RAM and 64GB internal storage. It features a 6.3-inch QHD+ display and features a 12MP dual-rear camera and an 8MP front-facing sensor. You can purchase the smartphone here. The smartphone is powered by the company’s own Exynos 7870 processor with 4GB RAM and 64GB internal storage. It sports a 5.5-inch full HD display and comes with 13MP rear and front camera. You can buy the smartphone here. The Moto X4 features a 12Mp + 8MP dual rear camera setup and comes with a 16MP front facing sensor. It features a 5.2 inch Full HD Display and is powered by the Qualcomm Snapdragon 630 Processor. The device has received an extra Rs 2,000 discount and you can buy it here. Honor’s quad camera smartphone, the Honor 9i comes with a 16MP + 2MP dual rear cameras and features a 13MP + 2MP dual front camera. The smartphone features a 5.9-inch Full HD+ Display and is powered by the company’s own Kirin 659 Octa Core platform with 4GB RAM. You can buy it here. Amazon has slashed the price of Samsung Galaxy A8+ and it can now be purchased at Rs 29,990. The smartphone comes with a 6-inch Super Amoled infinity display design and is powered by an Exynos 7885 octa core processor with 6GB RAM and 64GB ROM. You can buy the smartphone here. The Samsung Galaxy A7 is powered by the Exynos 7880 octa-core processor, coupled with 3GB RAM and 32GB internal storage. It features a 5.7-inch sAMOLED display and comes with a 16MP rear and front-facing cameras. Purchase the device here. The smartphone is powered by the Qualcomm Snapdragon 410 SoC with 2GB RAM and 16GB internal storage. The smartphone features a 5.5-inch TFT HD display and comes with a 13MP primary and 5MP front-facing camera. You can buy the device here.